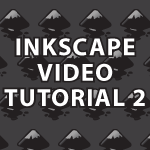 In this part of my Inkscape Video Tutorial I continue to teach how to use the tools Inkscape provides. If you missed part 1 you may want to check it out first. This time I cover how to: Create Keyboard Shortcuts, Document Properties, Tricks for Selecting Objects, Guides, Rulers, Align, Transform, Rows & Columns and more. I’m going a bit slower then normal in this tutorial to make sure everything is easy to understand and remember. How do I get the DIALOG boxes to come up when I start Inkscape or reopen my drawing? It is a pain to rebuild my work space each time i open Inkscape. Thank you 🙂 For some odd reason there is no way to save your workspace.